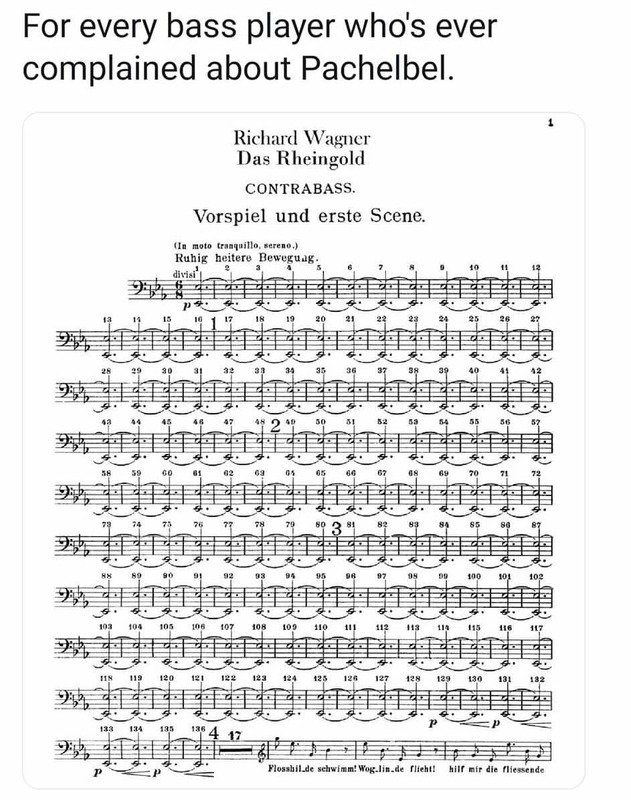 Ok, I'm going to go super-musicologist on this meme, but only because it's slightly ironic as Wagner and Pachelbel accomplish very much the same foundational, sonorous effect with both, at least aesthetically. Pachelbel's Canon is built on a tonic expansion Romanesca schematic progression (I-V-VI-III), utilized by all students of composition following the Carissimi -> Kerll heritage. In short, something that every student composer had to master in the 18th century. It opens the space for free melodic-motivic play above as the canonic progression of the bass takes care of the architecture, liberating the melodic instruments. Wagner's Eb in the basses at the start of Rheingold is primordial soup, the spring of the Rhein, out of which the Ring is born. I am far from a Wagnerite, but this Eb is one of the most genius musical inventions. It is intended to literally, not even allegorically, open the space of Teutonic mythos that the audience is in for 16 hours ahead. Just imagine being in a pitch black Bayreuth and you feel the rumble of this Eb from under you in the submerged pit of Bayreuth. Ah!